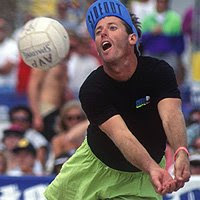 I thought SideOut was a brand relegated only to the golden age of beach volleyball, but apparently it's making a comeback. Todd Rogers signed a deal with brand owner, Cherokee, Inc., to wear SideOut gear in Olympic matches and on the medal stand. Dude, I am so looking forward to the resurgence of neon! Now whatever happened to Spot Sport ...? Update: SideOut's web site is some kind of craptastic PowerPoint slideshow focused just on brand licensing. Where are the oversized foam visors? I was promised oversized foam visors!